To be truly appreciated, this instrument must be seen either under stage lights or outside, in the sun. The finish on this violin is one that I had not used before. It is a combination of “Ultra Rainbow Mini Flakes” – usually used for a rainbow “sparkle” on cars and marine craft – and clear lacquer, hand-sprayed in layers and then sanded. When I attend exhibitions of instrument makers, I always take this instrument with me. 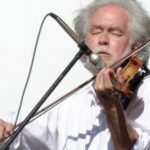 It is the instrument that, without exception, always receives an “oooh” or “ahhhh” reaction. Apart from the rainbow finish, the instrument is, relatively, traditional. Again, geared “Perfection Pegs” are used for ease and accuracy of tuning, in addition to a 5-string Thomastik-Dominant tailpiece. 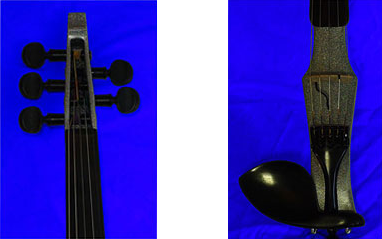 The instrument is extremely light – approximately 1.4 pounds – and stands out when played onstage.